Sandra O’Keeffe is a a personal trainer and fitness instructor, nutritional advisor, and motivation and weight management coach. She knows a lot about negative eating behaviours and how they affect our moods and mental well-being in general. She has some thoughts on how we could love our body more and was happy to share. We are often told that we should love the body that we are in and embrace our curves and how strong is the new skinny. Do we actually follow or believe this advice or do we still focus on the areas of our bodies we want to change? Firstly, tune in to who you follow on Facebook, Instagram or Snapchat. These have more of an impact on how you feel about your body than you might think. After you look at these newsfeeds, ask yourself, “do I feel better or worse about myself”. If you are left feeling like you don’t measure up or that you need to change things then maybe you need to unfollow these pages and look for those that make you feel good and can motivate you to be best you can be, which is pretty darn unreal. Remember also you only see the highlights of celebrities lives and not their day to day reality. For instance when you take a selfie how often do you switch angles or apply a sneaky filter to be at your best. The celebrities do this too. They very rarely show their just up out of bed, with a spot and feeling crap pictures. So don’t compare their highlights to your day to day life. Secondly, often we can be bombarded by people telling us what is healthy and unhealthy and it can get all confusing. How about firstly focusing on adding in things to your day to day life that make you feel better. For instance add in more water or a walk with a friend and a chat or even aim to try something new like a kangoo or spinning class. Try just one of these this week. Don’t aim to cut out all foods you love and please don’t do exercise that you hate. If you hate trying to drink that healthy green smoothie and the thought of a run brings you out in a cold sweat. Don’t do them. Forcing yourself to do these above things make you see healthy eating and exercise as a chore or something to dread. It needs to be enjoyable. If it is enjoyable you are more likely to keep doing it. Third, listen to things you say to yourself. Ask yourself if you would say those things to a friend. Try to catch yourself when your being a mean girl to yourself. Remind yourself that you are doing your best. This can take time but only by listening to your inner mean girl can you start to dial down the volume of this in your own head. It take practice to stop been critical to yourself but being more aware of your thoughts is a good first step. Fourth, Stop the comparison head games that we all so often play. This can be hard to do in reality as often our natural reaction is to compare ourselves to others. In terms of body shape everyone is so different and your goal might be better served in striving to feel the best and healthiest you can be in the body you have. For instance if I was to compare myself to a super model who is 5ft 9 inches tall, I would definitely fall short. I am 5ft nothing and will never have the legs of a supermodel. So can I change this? Nope, but what I can do is lift weights and exercise and become strong and feel healthier in the body I have. This takes time and practice. Often it is about catching yourself when you compare yourself to others and say simply “they are not me and I am not them”. Finally, start by setting yourself a goal. An activity based target such as a couch to 5 k or a cycle race or something that encourages you to become more active. This moves the attention to what your body can achieve and less about how it looks. Start zoning into how strong, fast or simply happy you can feel by moving your body more. Try out different types of movement until you find your thing. Eating well and moving our bodies should feel good and if it doesn’t you need to look at why. Are you being too strict in cutting out all your favourite foods and are you doing exercise you really hate? If so stop. Work out and eat well because you love your body not to change it. 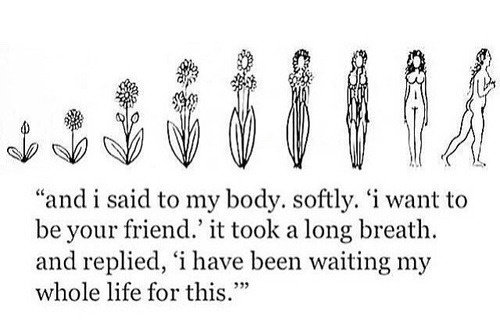 Feeling better about the body you’re in takes time and practice but it can be done. Try these small steps and they may help you start to feel a little better.